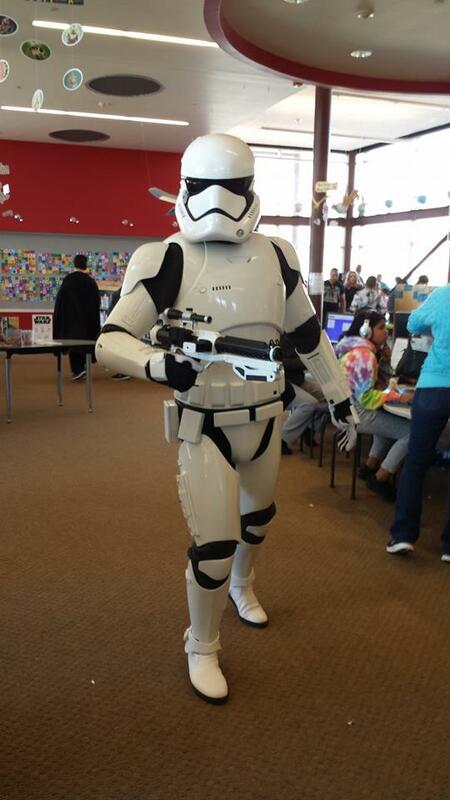 Yesterday, for t he third year, Quelab participated in the Rio Rancho Library’s Star Wars Fest. We were able to show off various disciplines that are offered at Quelab and let people know about our space. This year was the event’s 6th (or is that Sith?) occurrence. As in the past, the event was VERY successful, and of course a very fun to be a part of! The three hours passed by quickly and it was over before we realized it. A HUGE shout out and thank you to John “JT” Benedetto, Morgan Gangwere, Alice and Patrick Shriver, Darrel Knutson, Eric Lee and Josh Pedersen for volunteering their time and talents in helping Quelab have a presence at this event. A thank you as well goes out to Craig “Zoot” Goldsmith for coming to the event and taking these pictures. Quelab had its’ (now becoming) standard Star Wars exhibit set up with 3D Printing, prop style lightsabers, combat lightsabers, and various forms of laser cut artwork. However, this year we did something different. Since this event has been so good to us in the past, in terms of new memberships as well as cash and equipment donations, Quelab gave back to the event. Simple and easy X-Wing and TIE Fighter kits (small ones, about 11-13 pieces) were cut on the laser cutter, bagged up, and given to the library. These proved to be VERY popular, as many of the participants came to the Quelab tables and thanked us for making cutting these as they proudly showed off their assembled kits. 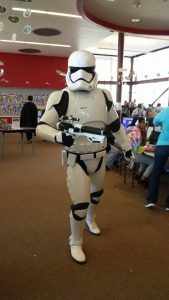 Our presence at this event is very much noted and appreciated by not only the public, but especially the staff of the Loma Colorado branch of the Rio Rancho Library. Event organizer, Librarian Jenna Wells, expressed her appreciation many times during the event, starting with when we walked in the door. Many other staff members stopped me as I took a moment to walk around, to say thank you and how much they appreciated our presence. The Library Director also came over to our tables to personally thank us. As the event was wrapping up, I had a chance to walk around. I heard two different groups of librarians comment about us – “Those Quelab people are incredible!” and “That Quelab display was amazing”. We have become a staple at this event, and as such, we have already been asked to come be a part of it again next year! It would be nice to grow in our presence, and add more examples of what we do. One in particular is a Star Wars themed corn hole game. This could show off woodworking, electronics (if we want to get really fancy), large format printing, laser cutting and fabric arts! So, if you’d be interested in helping with this becoming a reality, don’t be shy, and let’s talk! If you have any other ideas for a Stars Was related exhibit or activity, please share them as well! Thank you again to the participants, as well as everybody else who has taken the time to read this. REMINDER: January meeting date moved to 1-10-2016! Just a reminder that our January monthly community meeting has been moved to a week later than it would normally be! It will be held on January 10th. This meeting will be the continuation of our December meeting strategic planning process. A special visitor to HackNight! Last night’s hacknight had a special visitor: Sonny Jeon, the developer behind grbl – “a free, open source, high performance software for controlling the motion of machines that make things and will run on a straight Arduino.” It is loaded on the Arduino running our Shapeoko 2 Mill (thanks, #INVENTABLES!) as well as many many more machines worldwide. He emailed us, then came in to donate some CNC equipment & brewing supplies. Sonny had great discussions with Aaron & Morgan & others, and he even updated the Arduino running our Shapeoko to the latest version of grbl (freshly released in the last day or two)! This new version is much faster, and we can already see the difference in movement of each axis. If you’re a member of our Facebook group, you’ve probably already heard this, but we won a really neat tool! 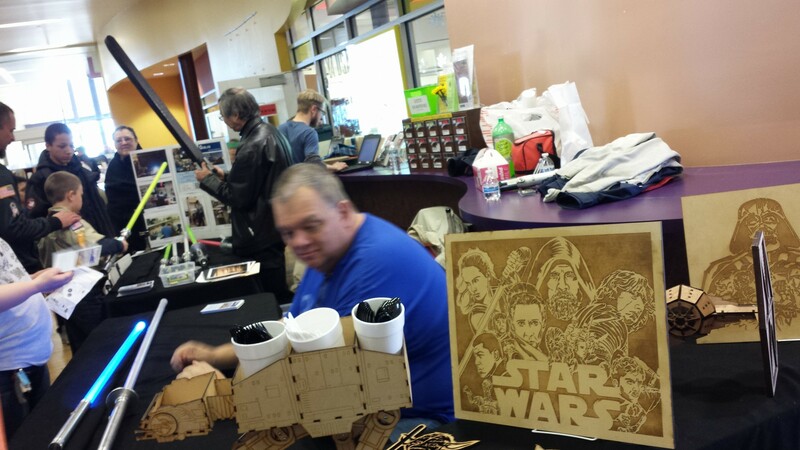 It started with Mr. What (Aaron) emailing out to the members mailing list about the Inventables.com contest – they were giving away a Shapeoko 2 3D carving machine to a Maker Community in every state. That message led to a back & forth flurry of others between members, officers & the board of directors, talking whether we should apply for it (honestly? That was the easy no-brainer part! ), and the best way to fill out the application. We worked & worked, and edited & edited, down to the wire, and made the deadline to submit. And we won for New Mexico! Yay, Quelab! That was last month. Since then, Inventables contacted us with instructions how to actually get our hands on their magic machine. Walter volunteered to be the point man, so it was delivered to his house. I can’t imagine how excruciating is must have been to have that sealed box in his possession, yet not able to open it! While everything is included, it comes as a kit, so there’s much work to be done in getting it all together & ready to cut. We just found out — Quelab won a Shapeoko Mill as part of the Inventables 50 States Contest. 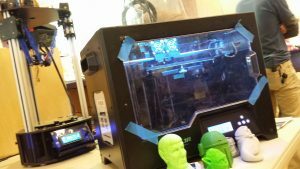 Inventables decided to give away a Shapeoko Mill to a Maker Community in every state, and our application won for New Mexico. We have been told we should have the machine by the end of the month. More details to follow!